So you want to try online advertising utilizing a landing page? Here are some Tips for Mortgage landing page advertising. 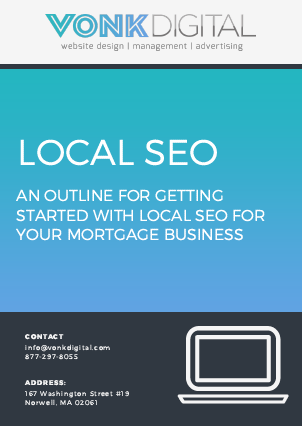 The idea or purpose of a landing page is to simply capture leads from your mortgage advertising. The goal is to give just enough information to the person viewing your landing page to understand what it is about, and want to see more. You have to give enough information to get their interest, but leave enough out so the person will want more. If your landing page is to vague, you run the risk of getting junk leads. If you give to much information, the viewer may move on without entering their contact info. One of the biggest mistakes people make on their mortgage landing page advertising is putting links to other sites, such as YouTube or review sites like Yelp. If you have these links on your landing pages, don’t use them as selling tools. Make sure they are small and discrete. For example do not put large text in the middle of your page “SEE OUR VIDEOS” that links to YouTube. You have now just paid advertising money for someone to go to YouTube. The next thing you know they are watching dozens of cute kitty videos and have completely forgotten how they got on this YouTube tangent. Avoid directing people away from your page. It is bad for business. Tracking is another important component to using a landing page, especially if you are advertising on multiple sites. For example, if you have one landing page you want to use for a banner ad on X Website and Y Website. You must be able to track which leads are coming from which site. If you are using a 3rd party company to manage your landing page advertising campaign they will usually take care of this for you. However if you are doing the work be sure you can track it. If 85% of your leads are coming from your X Website ad, wouldn’t it make sense to ditch the Y Website and put those dollars towards the better performing X Website? Of course it would. ALWAYS TEST… That’s right… TEST. Make sure that everything is working – I am talking about everything from the lead capture forms to your grammar. Be 100% sure the leads are coming through. Look for spelling errors, double check phone numbers, and read everything out loud. Have someone look over your landing page for you.. They might see something you missed. Want to see a landing page that does what it should? This is landing page we designed for our clients. 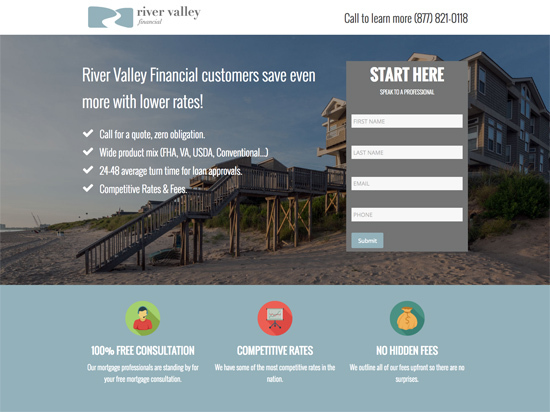 Our Mortgage Website clients get landing pages for FREE with their websites! 1. Layout: Its clean and simple. Do not make your landing page to busy, people are lazy and won’t read everything. 3. Information: The highlights are there and that’s it. That’s what you want. Give a little but not to much. 5. Testimonials: It never hurts to share what happy clients have to say about you.